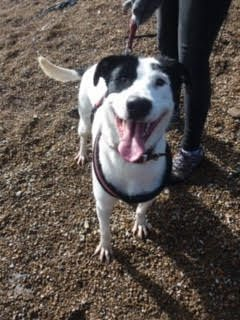 Roxy is a very happy Collie cross who loves life. She is a young girl at only 10 months. Roxy loves other dogs and wants to play with any she sees. She needs training on how to walk nicely on the lead but is getting used to wearing a harness. Roxy is eager to please and would make a lovely companion. She loves her food and knows how to sit. Roxy would be good around slightly older children due to her size and lively personality. Roxy loves attention, affection and cuddles.